While "Panic" might be a more appropriate title, Blindness is in some ways like Children of Men, another post-apocalyptic film starring Julianne Moore. The film, based on a novel by Jose Saramago, tells the grim story of what happens to humanity when hope is either lost or taken away. However, Blindness manages to accurately capture the true nature of the heart of mankind, offering a perspective on redemption, heaven, hell and relationships that is staggering. Blindness stars Julianne Moore and Mark Ruffalo and features strong performances by Lethal Weapon star Danny Glover and Gael Garcia Bernal (Motorcycle Diaries) in probably the first moody drama of the pre-Oscar season. Blindness has scenes that are gut wrenching, disturbing and beautiful. It's shot in a gritty format, leaving little to the imagination. The sound in the film is meant to mimic how a blind person hears the world and, early on, acts as a kind of foreshadowing. 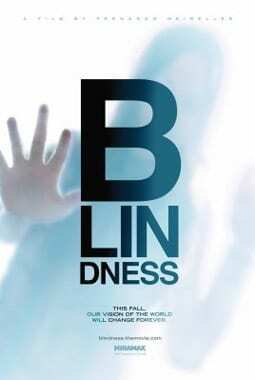 Blindness begins when a man suddenly is affected by unexplained blindness, only he sees all white instead of all black. When a good Samaritan assists him, the illness slowly begins to spread from person to person, eventually affecting countless people throughout the city in which the film is shot. The city has no name or face, it is obviously not American, but it might as well be. The people speak English and just about every detail is similar to American life. The government and military get involved when the first group of "infected" people are discovered, and they are sent to an old mental institution where they are quarantined from the rest of society, obviously in hopes that they don't affect any others. Those sent off into the quarantine begin to create some type of order until one particular ward decides to take control, led by Garcia Bernal. From that moment on, Blindness begins to analyze the ugly depths of the soul in a thousand different ways. The main character in Blindness is Julianne Moore, who plays the wife of an eye doctor and the only one in the film who can still see. She is never affected by blindness, and while this stays unexplained throughout the film, it is used by the director and writer in a magnificent way. Her character becomes overwhelmed by the responsibilities that would befall a person in her state: taking care of her blind husband; taking care of countless other blind people; mediating with the increasingly aggressive and criminal ward; and, doing it all while keeping her ability to see a secret. Her stress and overwhelming anxiety continue until it reaches a boiling point, which sets off chaos. In our current political and economic times, there are a million ways to interpret the film Blindness, but in the end we see that those who have the ability to see have to care for those who cannot. Those with means must care for those without, those with knowledge must teach those who don't possess it, and so on. Julianne Moore's presence in Blindness is more than a godsend to these people. She is their Moses, leading them through the wilderness without even the ability to hate them for their malady. Blindness is directed by Fernando Meirelles who also directed City of God and The Constant Gardener. Like City of God, the film's grainy texture and stunning reality remind the viewer of how life must be for those in our current world living in poverty and hunger. Images of people blindly tripping through human waste and violating each other without even the ability to tell white from black are thrown again and again on the screen. 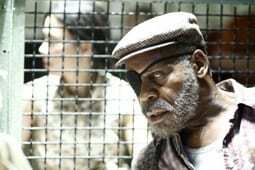 In a scene both humorous and depressing, a blind man uses a racial slur to describe another man. Blindness is by no means a family friendly film, nor is it a date movie. However, the power in a film like this to communicate the power and frailness of humanity is rarely seen in an age when fart jokes and kung-fu explosions make up every other release. To say this is an "important" film is to miss the point. It is a piece of art that will last longer than slapstick comedies, T&A films and explosion filled blockbusters. This film is recommended to those who are game to have their beliefs and philosophies challenged. Blindness immediately makes one think of those high school debates, "Is man basically good or evilä" Although this film doesn't take sides so much as it holds a mirror up to the soul of mankind in general.